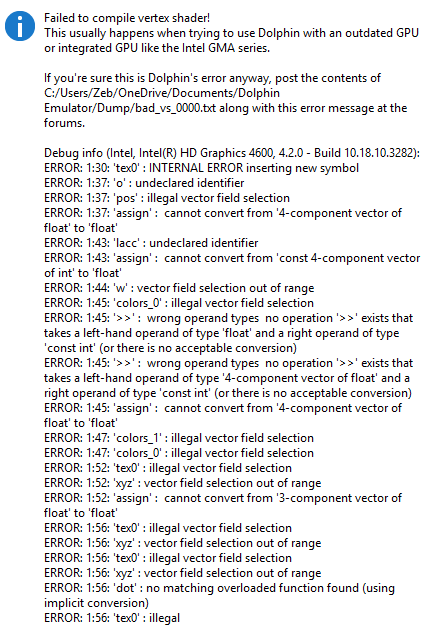 I do indeed have an integrated graphics card, but is there any way to get around this error without the need of a new computer, or what is the latest dev build that OpenGL is stable? 4.0.2 and 3.5 are too slow on my computer to be enjoyable. This should fixed in 4.0-4703 (which happens to be the build after the latest you've tried). So, download the latest development build. I hope that fixes it, but I may have not understood the changelog of 4.0-4703, and maybe this doesn't fix your issue. (12-20-2014, 09:36 AM)Buddybenj Wrote: This should fixed in 4.0-4703 (which happens to be the build after the latest you've tried). So, download the latest development build. I hope that fixes it, but I may have not understood the changelog of 4.0-4703, and maybe this doesn't fix your issue. Kind of. 4703 did the same at 4701, but I also tried 4708. The error message is gone, however, 4708 just has the same issues as the 46xx: it worked the first time, then crashes again. Neither restarting dolphin nor my computer guarantees no crashing, it just feels random. This is the shader cache issue, I think? Try deleting your shadercache before every run and seeing what happens. (12-20-2014, 09:51 AM)JMC47 Wrote: This is the shader cache issue, I think? Try deleting your shadercache before every run and seeing what happens. That fixes my issue, cool, though it's pretty ghetto and I like automating things. Is it possible to make a .bat file that deletes the contents of ShaderCache, then loads dolphin? You only needed to delete it once because a shader that was incompatible with your GPU was introduced in the dev builds. It was fixed later on and now that you deleted your shader cache you're using the latest version of that shader.